Old plate wearing is legal, but it has to be year of manufacture, and the statute has a couple points of hilarious badness in how it’s written. One is that I would have to produce the real plate for *anyone*. No, they don’t specify law enforcement personnel, it’s literally “ANY PERSON”. To not do so is a misdemeanor. Really. Also, the statute is “may bear the license plates of the year of manufacture”. Does that mean any old ‘63 plate? Well, probably, but that article “the” makes it sound like the original plates, which... that’s not happening. Do I really want to get into a sophistry fight with a cop on the meaning of “the”? 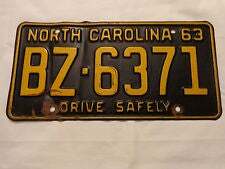 Also, the statutes are a bit cloudy on whether and how the legibility laws apply to the old plate. Using an antique plate that’s been repainted might literally be a felony even with it as a placeholder, because paint. HURR HURR. On the other hand, buying a single old plate is one-time expense and not any more than a custom plate annually and I’m cheap. Hmmm.